So recently I've got this wonderful 4 channel 200 MHz GW Instek GDS-2204E scope. As there is no tear-down available, made one myself. As I also have Rigol DS2072 unlocked to DS2202, further will call it DS2202* (100% same as newer A version but without built in 50 ohm termination), will make comparisons too, mainly because many people might choose between GDS-2000E and DS2000A or even 1000Z when buying the scope. Size comparison, controls, menu. GDS-2000E is a bit bigger than Rigol. About 1 cm wider and 1.5 cm higher. Rigol is much deeper though, so in many cases GW Instek may take less space on your bench. Space organization on the GW Instek front panel is so much better than on Rigol. Controls are not cramped and easily accessible. Buttons so much easier to press unlike on Rigol, pleasure to use actually, never had such feeling about my Rigol. No need to find the right thing in the cramped jungle, just press or turn what you need. Attached probes don't obstruct the lower part of controls unlike on Rigol. Menu also is much more intuitive to use, also it is instant fast unlike on DS2202*. Overall scope design looks pretty good, looks better than on the pictures and certainly looks better (at least for me) than DS2202* standing nearby. Display sizes are the same on both, but looks bigger on GW instek because of the black bezel. This scope has no metal shield on the back and some forum members complained about this, including Dave when talking about GDS-1000B in the tear-down video, and saying that constructed not as well as Rigol 1000Z. HOWEVER this scope have two times lower noise floor than my Rigol DS2202*. So obviously this is not a problem at all. This scope has about 400-480 uVp-p noise floor, my DS2202* has about 1.1 mVp-p (actually there is some <1 Mhz ripple present). So I consider 500 uV/Div range in Rigol more like a gimmick considering it's actual performance. There is no high res mode in this scope, but as this scope shows noticeably cleaner waveform than Rigol, so this is not a so big issue. You can also enable digital low pass filter (or high pass) where you can fine tune cut off frequency to reduce the noise, or just enable averaging. With digital filter enabled, this scope still remains very fast. Also high res mode often is not so high resolution as you might think, often it hides actual signal. This scope overall have GREAT digital signal processing capabilities. I has intensity grading. Maybe you need to fiddle with settings a bit more than with Rigol but in many cases you can get GDS-2000 intensity grading working better because more possibilities to adjust it. Intensity grading works with different persistance time settings, lowest is 16ms (1 frame at 60Hz display refresh rate). On Rigol, intensity grading stops working once persistence time set to anything other than minimum. On Rigol, intensity grading and waveform looks smoother because there is some display smoothing going on not present on GW Instek. Don't know if it is actually better as this don't make the waveform any bit more precise, just looks a bit better. I'll say overall they are on more or less on par in this regard. EDIT: Actually there is a disadvantage in GDS-2000E, on fastest timbases intensity grading does not work. Waveform update rate (claimed 120k wfm/s) is certainly higher compared with Rigol, and much higher when larger memory settings is used. This scope can make actual use of it's 10mpts per channel memory (does not drop when multiple channels enabled). With Rigol, I'm not so sure. It just becomes too slow to actually use the large memory often. 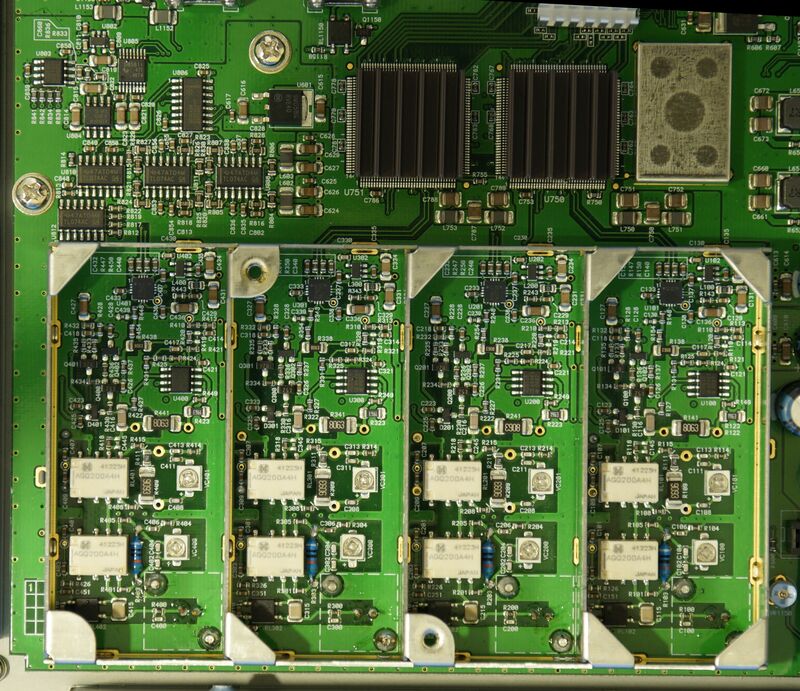 4CH GDS-2000 has two pieces of dual 500MSPS ADC ICs, on the 4 channel version 1 GSPS sampling rate when up to 2 of any channels used. If 3 or 4 channels simultaneously used, it drops to 500 MSPS. On the 2 channel versions it remains 1 GSPS regardless how many channels are used. Rigol has 2 GSPS max sampling rate, it has advantage in this regard when only one channel is used, otherwise no advantage in sampling rate. Also GDS-2000E has very good Sin(x)/x interpolation. Tested with 160 MHz sine (max I can get from my signal gen.) At 500 MSPS is looks as good as you can get. So lower max sampling rate might be not a so big deal. Also GW instek has faster timebase, 1ns vs 2nS on Rigol (200 MHz version, 1ns in DS2302A). Serial decoding comes with a scope already, no need to purchase separately, hacked on my DS2202*. Have not used it yet but there is another review by nctnico of DS-2000E on the forum, and according to it, it works really well. 1 Mpts FFT in GDS-2000E is just awesome and works very well. FFT in Rigol is a useless joke. Probes. Instek probes are better than Rigol RP3300A. Didn't use them a lot, but they look good. attachable hook works very well. Actually I hate Rigol probes, they are some kind of flimsy-bendy thing and I repaired them a few times already. At the BNC connector end, thin central conductor coming from the cable ( just kinda lives on it's own in the free air) shorted the ground connection so I needed to disassemble it and bend the conductor so it don't touch surroundings. Crap construction. Attachable hook on Rigol Probe never worked well either, they tend to stick in pressed position and feel scratchy when you press it for some reason. Also those rubber color rings are crap because never stay on place. Plastic rings on GW instek probes have not such a problem at all. GW Instek probes are much slimmer on the BNC connector side and don't obstruct anything unlike on Rigol. Oh, tired to write. The conclusion is that this scope certainly is a keeper and better than Rigol DS2000* in almost every way, so I think I will just part with my Rigol in the near future. 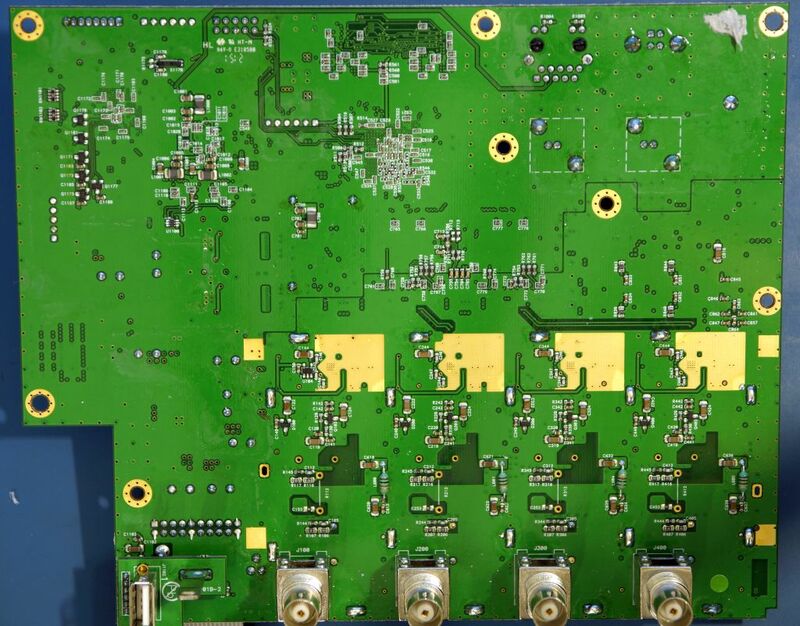 There are 4 boards: main board, display adapter board, front panel/UI board and PSU. 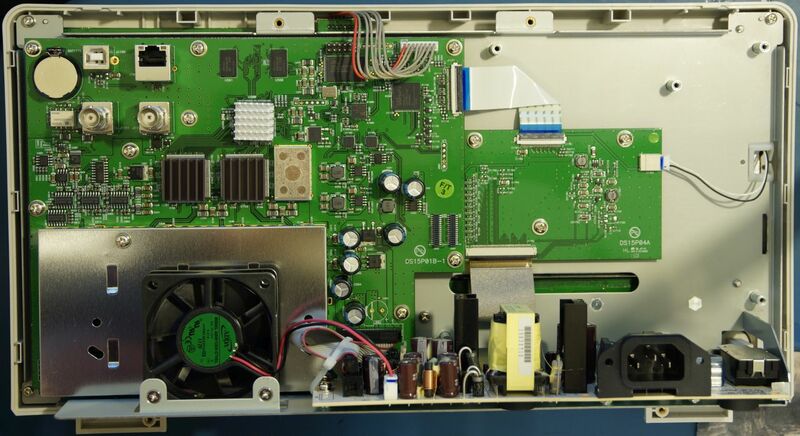 PSU is off the shelf unit made by Lytec, all of the capacitors on it are Japanese Nippon Chemi-Con. ADC: National/Ti ADC08DL502, there are two of them, 2 channel versions also have two of them.This is dual 500MSPS ADC, on the 4 channel version 1 GSPS sampling rate when up to 2 of any channels used. If 3 or 4 channels simultaneously used, it drops to 500 MSPS. On the 2 channel versions it remains 1 GSPS regardless how many channels are used. 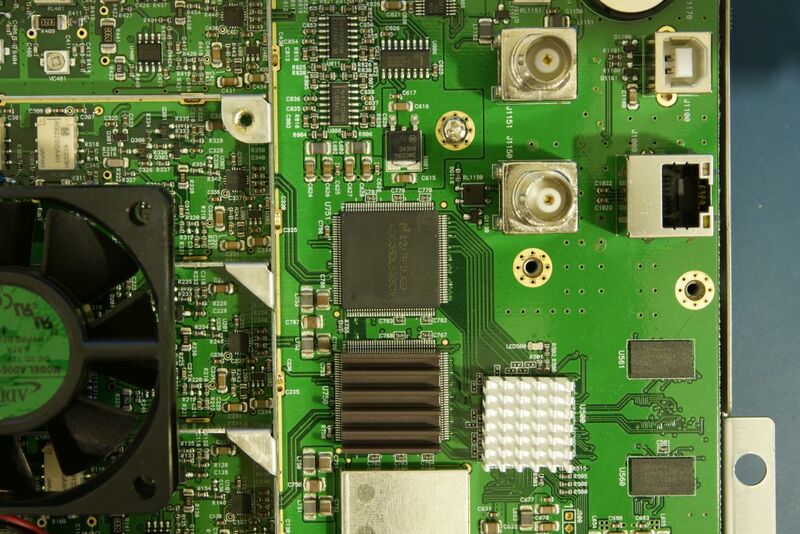 Main FPGA/CPU SoC is Xilinx ZINQ XC7Z010, The same as in GDS-1000B scope. 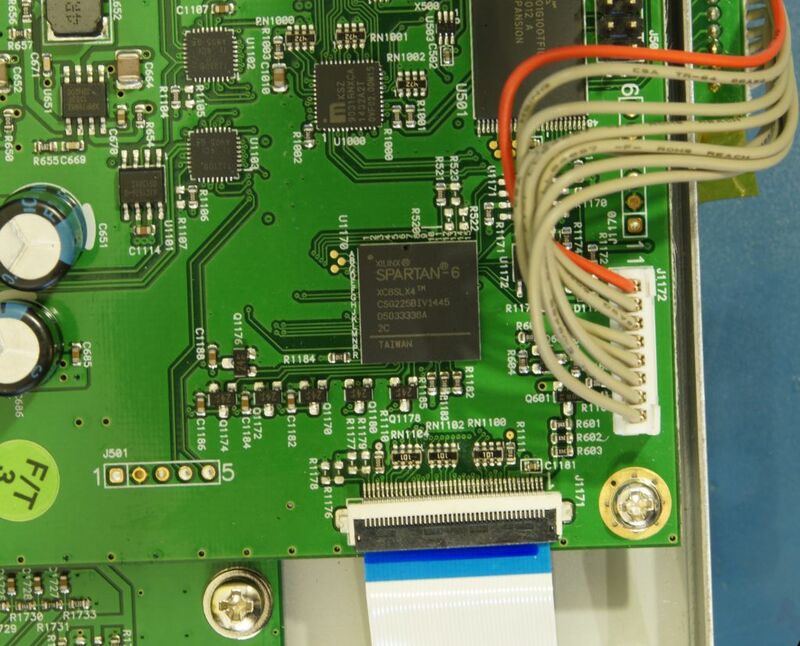 There also is connector on the main board and space for additional Logic analyzer board to be placed. There also will be a signal gen option as I understand. Thanks for the pictures and having the coconut sized balls to take your new scope apart this much! Nice overview, writeup and pics. Thank you for the review. GW scopes just work as promised by manufacturer. But Rigol has better specs on paper. DS2000 series can have logic analyzer and two channel waveform generator. They have 1GSa/s per channel or 2GSa/s when only one channel used. Do you like the search function of GDS-2000E? Who manufactured the rotary encoders? Do you like the search function of GDS-2000E? Have yet to try it in the real work. Who manufactured the rotary encoders? Added comparison about this. And corrected about GW instek sampling rates. Actually it does not care which 2 channels you use, unless more than 2 of any, it remains 1 GSPS. What about a comparison in price? That extra isolation in the Rigol scope, still seems to keep the price acceptable. Even Rigol could take the attitude of "this extra isolation is not needed", but decided to use the extra isolation anyhow. Then the question is, did Rigol do unnecessary isolation, or is GW-Instek saving on pennies to further increase their margins? So there are 4 PCB boards in total anyhow? 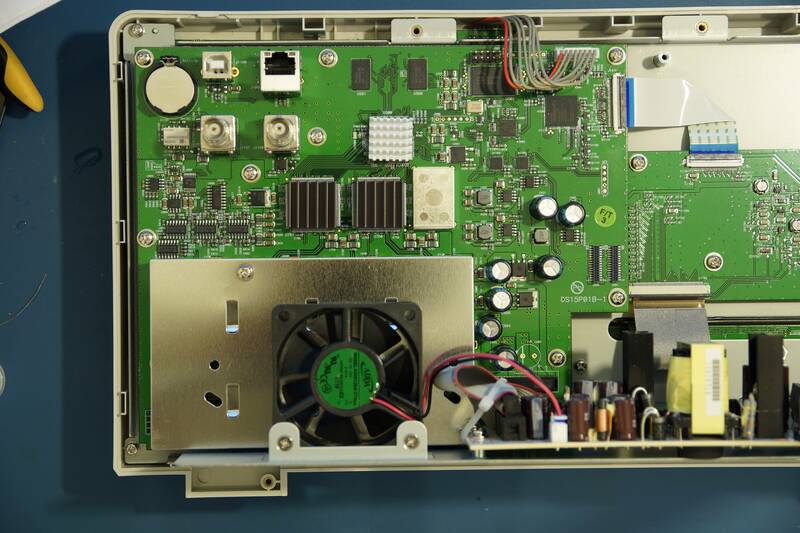 There was a user in another thread on this forum, who claimed that his GDS-2000E had only 1 PCB board, when this discussion was brought up. But it seems that there are 4 PCB boards anyhow, so I really wonder where that other user got his claims from in the first place, and why he denied that only Rigol is using one big PCB board. 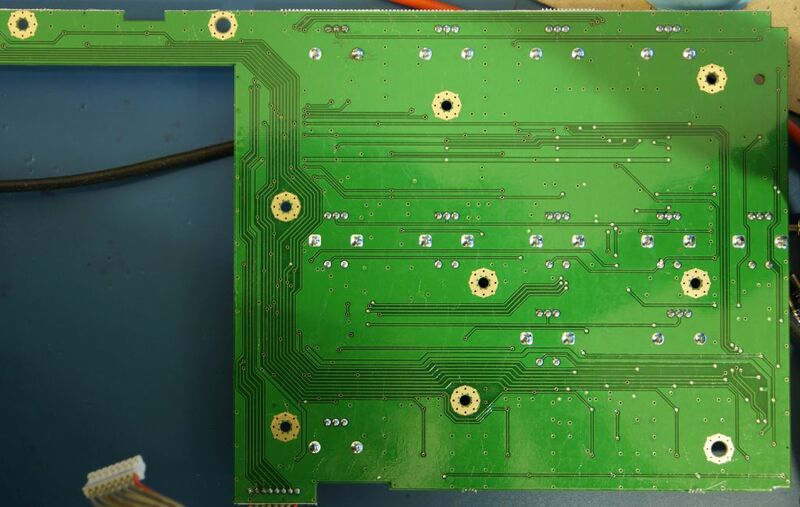 In most DSO's there are at least 3 PCB's. Period. There is no comparison in price when one scope works as advertised and the other does not. In the other thread the question was whether the primary part GDS2000E was made from a whole bunch of PCBs which could have easely been integrated into one board. The answer to this question is still that all the processing is done on one board. The other boards are there for mechanical reasons (BTW you forgot the small board with the USB socket and probe calibrator output). What I know is that this scope without shielding on the back has significantly less noise than Rigol with all of that shielding if you mean that as isolation. There is only one main board. What you are talking about is that in GDS-1000B there is a separate FPGA/CPU board which is not present in this scope. 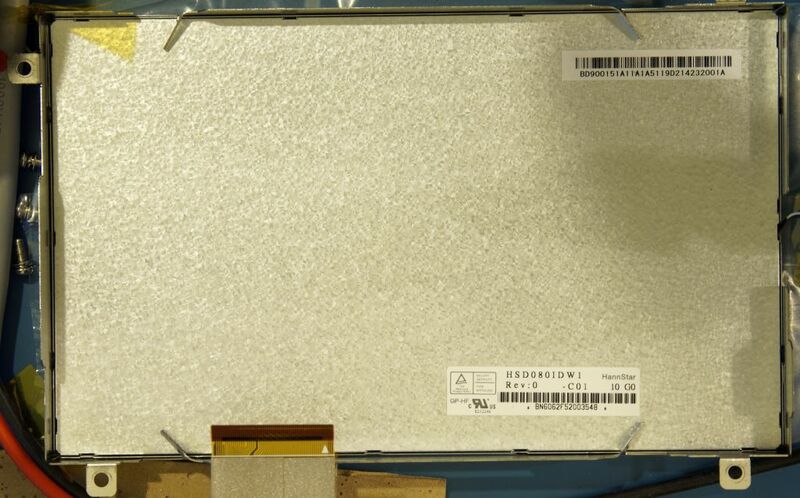 And no, that 1000B board is not off the shelf development board, there is GW instek part number on it's silkscreen. GDS-2000E is cheaper than Rigol DS-2000E and has decoding options off the shelf. My 4ch 200MHz GW instek is cheaper (1026.42 € + VAT )than 2CH 200 MHz Rigol and is more capable, yes you can still argue that you can get 70 MHz Rigol and hack it (Like I did with mine), but there is no 4ch DS2000, and GW instek is a much better scope. But GW Instek has more expensive parts on the PCBs. Obviously shielding in Rigol is not unnecessary because it is still much noisier even with this shielding. if they managed do design a scope which was quiet by itself, then it would be unnecessary. Most likely Rigol and Siglent are now also going to look into the Zynq-7000 series. Nice to know that the 4 channel GW-Instek GDS-2000E series is cheaper than the 2 channel Rigol DS2000A series in the same bandwidth range. And software is definitely an important point! in contrast with Rigol and Siglent. Given that these companies have such a high turn-over in terms of sales on scopes, why don't they have an overseas software department with European or American software engineers? European and American software engineers cost more. Same reason Rigol and Siglent don't offshore the manufacturing of the scopes to Europe or America. They are trying to make these scopes as cheaply as they can (plus they are Chinese companies). Also GW instek has faster timebase, 1ns vs 2nS on Rigol. Not sure if you mean the DS2202A here, some parts you seem to be comparing specific models while others you are talking about the whole series GDS-2000E vs DS2000A, so if you were strictly comparing the 200MHz models then you can ignore this because the DS2202A does have 2nS as its fastest timebase. But since the DS2072A can be upgraded into the 300MHz DS2302A, really the fastest timebase is 1nS. Well, I compared it with my hacked to 200MHz DS2072, though it can be hacked to non existent 2302 model too. Added a mention about 300 MHz model. I have one question. How they have done this 1GSa/s. Can you test all two channel in use combinations and these all really give 1GSa/s. Can we also then check if 1GSa/s is real or just digital side trick. http://www.ti.com/lit/ds/symlink/adc08d500.pdf 2x500MSa/s or 1GSa/s interleaved. This is only what have interleaved mode for 1GSa/s if read Ti data sheets about these ADC versions. This is in your image. ADC model is written in the text, as well as that is 2x500MSPS ADC. This sounds as if you try to prove me wrong. 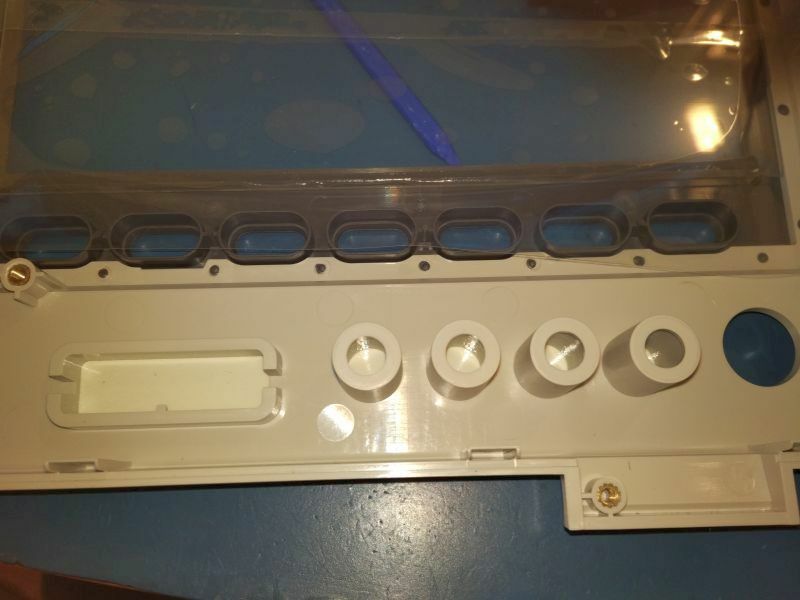 It seems that mux is going in these ICs, they have some apparently diff pair on the right side. So, due to two ADC chip and 4 channels arranges so that CH1 and 2 come to one ADC and Ch3 and 4 come to next ADC and with this you have detected what ever 2 channel select combination give information about 1GSa/s on the screen and it also have 1ns period with displayed "sample" dots. It rise question. What is this "1GSa/s". How they do this interleaving if selected 2 channels are in one ADC chip or if selected two challes are so that one is in other ADC chip and other is in second ADC chip. How they do this trick? This is really weirs until we get some reliable explanation how they do this. Inside ADC it looks like there can not interleave ADC's using internal 180 degree ADC clock phase shift. There need so some things when 1 channel is in use and 1GSa/s and also if there is CH1 and CH2 OR Ch3 and CH4 selected. How it is possible to do real 1GSa/s in all theese cases so that both channels or just 1 channel is in use. I updated previous post, seems they do the mux before the ADCs. No, I do not at all try proof you are wrong. I'm wondering how GWI do 1GSa/s with used ADC chip. The same way as, for example, Rigol DS1000E done 1 GSPS with 5 dual 100MSPS ADCs (overclocked, as they were too cheap to buy a proper speed grade of that ADC). Internal mux is basically the only difference between ADC08D500 and ADC08DL502. If you do the mux outside of the ADC08DL500, they will be basically the same. First thank you for not be afraid to take it apart and share all with us. It is a more deeper question, and rfloop already figured out. Input MUX + 180 degree clock phase shift between internal 2 ADC.